If you are approaching your middle age, you may have noticed some changes in your vision by now. Have you had to extend your arm out more than usual to read your favorite book or look at a text message? If so, you are experiencing the frustrating symptoms of a common age-related refractive error called presbyopia. Presbyopia is a natural regression in near vision. Inside of the eye, a naturally clear, flexible lens is responsible for focusing light onto the retina. This lens is normally flexible, allowing your eye to flex and “accommodate” for close up vision. As we get older, this lens becomes more rigid and is no longer able to accommodate near vision. This is when you start experiencing presbyopia symptoms. Presbyopia is a progressive condition and gets worse over time. Symptoms may be mild in your 40s and become life interrupting by your 50s. Typically, presbyopia is managed through the use of reading glasses. Reading glasses are certainly a great temporary fix for presbyopia, but for some, they quickly become just as annoying as presbyopia itself. When it comes to presbyopia treatments, there has not been much in the way of advancement until pretty recently. Today, you have more options than ever. One of these options, available at Bausch Eye Associates, is called the KAMRA® Corneal Inlay. The KAMRA® corneal inlay is a tiny, ring-shaped device used to reduce or eliminate the effects of presbyopia. The KAMRA® inlay sits within the first few layers of the cornea. The inlay is smaller and thinner than a typical contact lens, with a donut shape, leaving a small “pinhole” in the center. This pinhole assists in focusing light onto the retina. The KAMRA® is implanted into only one eye, allowing both eyes to work together for sharp vision near and far. The KAMRA® inlay is also removable, should you not like the results. While the KAMRA® inlay is extremely advanced and effective, it may not be for everyone. Conditions such as dry eye syndrome, keratoconus, corneal injury or pregnancy can all disqualify you from safely undergoing this procedure. The best way to find out for sure if you are a candidate is to come in for a KAMRA® consultation. 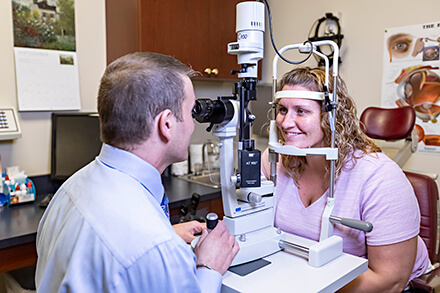 Our experts at Bausch Eye Associates are here to help you make the best decision for you and your vision. If you are thinking about presbyopia restoration, book your consultation with our doctors at Bausch Eye Associates today. With the KAMRA® corneal inlay, you can ditch those reading glasses for good!